French Polynesia exudes exotic allure. From Tahiti to the smaller islands, they’re considered an unspoiled paradise, too. Especially attractive to avid divers and snorkelers, the life underwater is extraordinarily varied. These are reasons why superyacht owners seek out Tahiti Private Expeditions. The company customizes dive services, logistics, and itineraries throughout the region—and farther afield in the Pacific. In fact, Tahiti Private Expeditions is the leader for these VIP experiences. This, in turn, is why we’re delighted to be its newest partner. Together, we’re offering its customers one more special service: customized coffee table books. 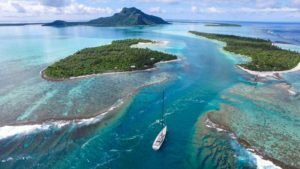 The Tahiti Private Expeditions team, led by Rodolphe Holler and Christelle Holler, has extensive, personal knowledge of the best cruising and diving destinations throughout the region. Wherever you yearn to travel, the company provides discreet, private service. Besides providing an experienced dive guide onboard your yacht for a trip, the company can, when requested, send a photographer or videographer. Between the high-quality professional images and the abundant photos that you, your guests, and your crew take, you can re-live the adventures again and again. In the course of customizing itineraries, the Tahiti Private Expeditions team is now alerting clients to our expertise at Superyacht Storytellers. Say, for example, a customer is celebrating a special event. If he or she wants to capture the magical moments in the islands in an extra-special way, the company will explain what we do and provide our contact details. This way, we can discuss directly the creative possibilities. Imagine oversize, full-color photos of different species of sharks… page after page of brilliant reef fish and stunning corals… all brought together in a beautifully bound, completely customized coffee table book. If they visit French Polynesia certain times of the year, they might even be lucky enough to capture images of humpback whales and their newborns. As younger members of the family grow up, they can enjoy learning of the family’s adventures—and look forward to creating their own similar ones soon. To learn more about Tahiti Private Expeditions, visit http://tahiti-private-expeditions.com/.